The effect that the 1993 E. coli O157:H7 outbreak had on the food industry was tremendous. Responsible for more than 600 illnesses and the deaths of four children, the outbreak led to significant changes in the industry’s approach to food safety. “[It] drove a shift in food safety that many had been working toward for years,” said Rima Khabbaz, M.D., acting deputy director for infectious diseases at CDC during the “We Were There” CDC lecture series, adding that the focus moved to food suppliers and how they could make their products safer. “The outbreak drove a paradigm shift that opened the door to food safety,” said Patricia Griffin, M.D., chief of the CDC’s enteric diseases epidemiology branch during the lecture. 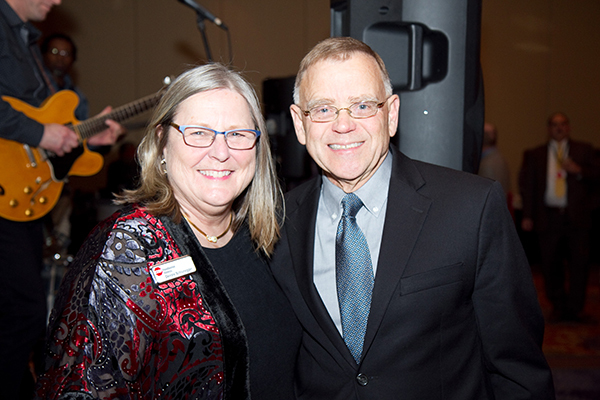 Deirdre Schlunegger, CEO of Stop Foodborne Illness, and Michael Taylor at Stop event celebrating Food Safety Heroes during the 2015 Food Safety Consortium. Within a few years, several actions and initiatives paved the way for notable progress. 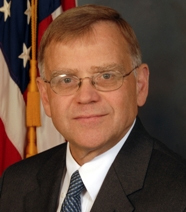 In 1994, Mike Taylor, who was administrator of USDA’s FSIS at the time, made a speech that “shocked and outraged the industry,” said Griffin, where he stated, “we consider raw ground beef that is contaminated with E. coli O157:H7 to be adulterated within the meaning of the Federal Meat Inspection Act.” From there, the USDA worked on the first major advance in meat regulation. In 1996 the agency established the Pathogen Reduction Rule to improve meat inspection. The same year CDC’s PulseNet was born, the nationwide lab network that uses DNA fingerprinting to help identify outbreaks early, along with the Foodborne Diseases Active Surveillance Network (FoodNet), an epidemiological system that tracks incidents and trends related to food. In a Q&A with Food Safety Tech, Mike Taylor, most recently the former FDA commissioner for foods and veterinary medicine, discusses the dramatic change that industry has undergone during the past 25 years, from FSMA to technology advancements to food safety culture. Food Safety Tech: Reflecting on how far the industry has come since the E.coli O157:H7 outbreak involving Jack in the Box in 1993, what key areas of progress have been made since? Michael Taylor: I think there are very major ones obviously. You have to remember where things were when the Jack-in-the-Box [outbreak] happened. We were in a place where USDA programs said it was not responsible for pathogens in raw meat and that consumers are supposed to cook the product; [and] industry was operating under traditional methods. Microbial methods were typically conducted for quality not for safety; you had the loss of public confidence and a terrible situation in which consumers were pointing at industry, and industry was pointing at consumers, and no one was taking clear responsibility for safety of the product. Now we are in a completely different environment where not only is there clarity about industry’s responsibility for monitoring pathogens, there’s also been enormous progress by industry to put in place microbial testing, something David Theno pioneered and is now a central part of food safety management systems for meat safety. These [institutional] arrangements exist not only in the meat industry, but now across the whole food industry. There’s the emergence of GFSI taking responsibility for managing the supply chain for food safety, food safety culture taking hold broadly across leading companies in the industry, and FSMA codifying for 80% of the food supply that FDA regulates the principles of risk-based prevention and continuous improvement on food safety. I think it’s rather dramatic how far the industry’s food safety regulatory system has come since [the] Jack in the Box [outbreak]. FST: How has FSMA helped to align industry priorities? Mike Taylor was on the front lines of change in the meat industry. Taylor: Let’s focus on the events first leading up to FSMA—for example, the outbreaks or illnesses associated with leafy greens [and] peanut butter, and problems with imported products—those events in the world aligned industry priorities around the need to modernize the food safety laws and to enact FSMA. It was the coming together of industry and consumer interests, and the expert community around the principles of comprehensive risk-based prevention that vaporized into FSMA. Now FSMA is the framework within which companies are organizing their food safety systems in accordance with these modern principles of prevention. And clearly what’s been codified in FSMA and some of the key elements are becoming organizing principles where industry is aligning our priorities for food safety. Environmental monitoring where that’s an appropriate verification control for a company’s hygiene and pathogen control—that’s clearly a priority that folks are aligning on. The issue of supplier verification for domestic and foreign supply is a priority that has been elevated by FSMA, and so has the whole issue of training and employee capacity, whether it’s in processing facilities or on farms, as well as food safety culture. If you’re going to be effectively preventive you need to deal with the human dimension of your food safety system. These are examples of ways in which FSMA is aligning industry priorities. Read the rest of the interview on page 2 (link below).